A group of hapless victims celebrate a birthday on an island estate crawling with evil frogs. 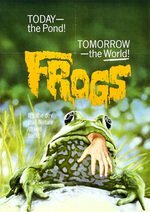 Spoiler #2: Even though the movie is called Frogs, and the poster features a frog with a man's hand emerging from its mouth, none of the characters is actually killed by frogs. The closest the frogs come to murder is by apparently inducing a heart attack in Jason Crockett at the end of the movie. Otherwise, the frogs croak a lot, loudly, and the other animals step up. Bonus points to the lizards in the greenhouse, who are strong enough to push giant vats of noxious chemicals off of high shelves, and still look cute while doing it. 1. This is a MeFi Horror Club post. Which I know we know, but still. 2. In the Talk post last week, I linked to the movie trailers, both of which are on YouTube. Imagine my surprise to find that one of the death scenes in the trailer did not match the one in the movie! Jason Crockett's daughter Iris goes butterfly hunting in the woods, and quickly finds herself menaced by snakes, trees, and mudpuddles. She falls down in a puddle, sits up, spies the butterfly net that she dropped, and reaches for it, only to be struck by a rattlesnake. The trailer, OTOH, shows Iris rapidly sinking into a bog. What happened, Frogs? I saw this movie at the best time and place to see this movie, in the middle of summer, in an isolated cabin in Maine, next to a lake, during a thunderstorm. It's so ramshackle and charming and low key. I love that, contrary to trope, all the black characters get the hell of thr dodge once It gets dangerous. Charmingly crude and low-budget and lurid. Oh, that is a completely perfect setting for watching this movie! Well done! I grew up in North Florida, my grandmother lived in North Central Florida in a large house on a lake that we were warned contained alligators...We weren't as isolated as the Crocketts, but as a youth I attended many, many family gatherings at a location strikingly similar to their estate. For that reason I've always had a special nostalgia for this dumb movie...I watch it about once a year. I sort of imagine Ray Milland stomping around the set, mumbling, "I have an Oscar, you know. I don't have to do this." But then again, that same year, he was also in "The Thing With Two Heads," so.